Kristo Käo has premiered and recorded many new compositions by contemporary composers (R. Eespere, T. Aints, M.-M. Lill, T. Kõrvits, L. Jõeleht, R. Jürjendal, T.Steiner, V. Värk, P. Prints, J. Rodriguez-Caballero). 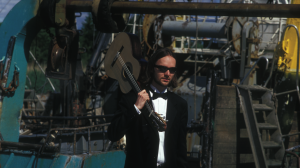 Besides, Kristo’s solo repertoire includes most of the classical guitar traditional repertoire: F. Sor, H. Villa-Lobos, J. Turina, M. Giuliani etc. Also, Kristo’s special interest is the Brazilian guitar music (I. Savio, E. Fenicio, E. Nazareth, P. Nogueira). In his solo programs, Kristo always finds time to talk to the audience and creates a free, non-academic atmosphere, no matter how difficult the music is.